Maximise the space at your workshop. 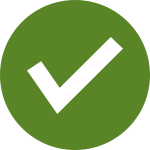 After doing some repairs and maintenance jobs at your home, the next challenge will be to ensure that your things are as organise as possible. 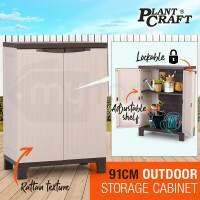 Good thing that Plant Craft has entered the Aussie home maintenance market as it has some ready solutions for DIYers like you! 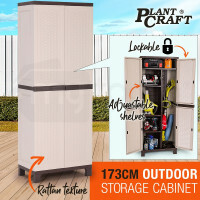 With its new line of outdoor storage cabinets, you can relax at your place, knowing that your equipment and other important stuff are secured and well kept in your garage or deck. 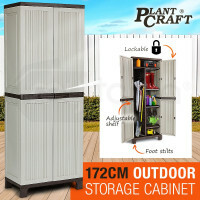 Available in 91- and 172-cm options, both cabinets are made from durable corrugated plastic and other weather and rustproof materials just to be sure that these items would last and could be used for a long time. 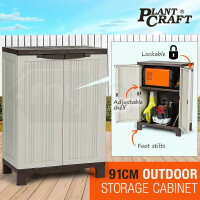 Keeping up to its promise of high quality products, Plant Craft ensures the safety of things that are being stored inside as every cabinet features large stilted feet to keep the stuff out of spills and floods. Designed to be friendly to users, a range of locks can also be used to secure the cabinets’ doors. Customised your storage options. These modern-looking products feature removable and adjustable shelves to cater your organisation needs. Clear your backyard clutter. Purchase both storage cabinets, complete the set and you will surely boost the storage space outside your home. Looking for the best way to declutter your home easily? Have a look at the other top of the line garden products that are being offered by Mytopia. Pair these storage cabinets with the other Outdoor Storage Boxes and save some space at your home. Also designed to help you with your outdoor activities, these storage boxes could be easily transported so you will have extra room for your camping things. What are you waiting for? Organise your place now. Order and avail of these space savers and Mytopia’s other selected home items and be sure to get a year of warranty on us.